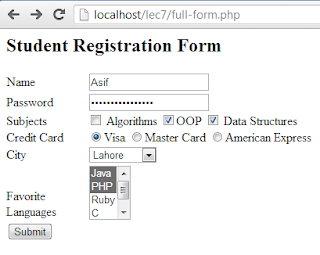 In this post I would explain how to process a form using PHP. Before we move to PHP code, lets see how our HTML code looks like which creates the form. I have included all possible basic controls (text, checkbox, radio, option list, etc) to demonstrate how fetching values for different type of controls differ when we write PHP code. If you know HTML, you know there is nothing special in above file. Its just plain HTML. Notice, action value is full-form-handler.php. It means, when the user submit this form, full-form-handler.php would be executed to process the form data. Input type text and password are handled just normally. $_REQUEST['name'] return the string value. In case of check boxes, only those check boxes values are submitted, which were selected/checked by user. Other check boxes are not submited. So we must have to check, which check boxes were received by server to know what user checked. About the radio button, you see we given same name to multiple radio buttons, why? because by doing so, we declare that only one radio button should be active at a time. For example, user credit card would belong to a single company. From same name, the web browser automatically deselect the previous crdit card of we choose another one. This technical post helps me to improve my skills set, thanks for this wonder article I expect your upcoming blog, so keep sharing..
Nice post.This post helps me alot in preparing a form using PHP.Thanks for this excellent post. Keep writing blog posts.keep sharing. Decent post.This post encourages me a great deal in setting up a frame utilizing PHP. A debt of gratitude is in order for this fantastic post.